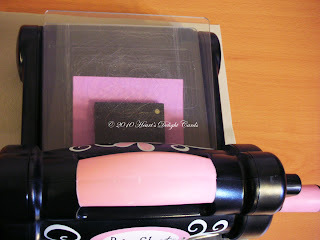 First of all, let me say that I love using the Movers & Shapers Curly Label Bigz XL Die. It makes a perfect invitation (A2) size card, already scored for the fold, with a fancy-shaped window pretty much wherever I want it. 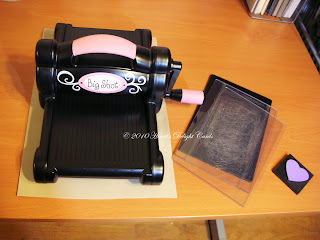 I use it not only to make windows in cards, but to make perfect little mats that fit the Stampin' Up! punches. Now, having said that, I don't like the limitations of the magnetic platform. You can only make an A2 size card (4¼"x5½"), AND the fold is along the short side of the card. What if I want the fold on the long side? What if I want to make an A6 card (4½"x6¼")? What if I don't want to make a card at all, but some 3D project that needs a window? What then? Hmmm??? 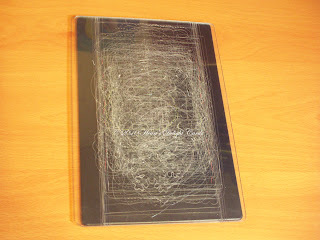 Place the black Texturz Impressions Pad on the bottom. 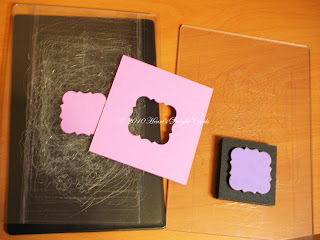 Lay your cardstock or DSP face up on the clear pad. 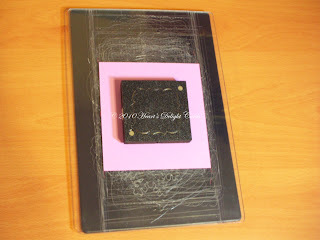 Lay the second clear cutting pad on top of the die. Now pick it up without disturbing the "sandwich" and run it through the Big Shot. Voila! That's all there is to it!!! 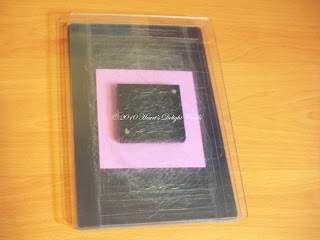 A nice little window wherever you want it, and a nice little mat for use with the matching punch. Which, in this case, doesn't have a matching punch. But you know what I mean. I saw what you did on your votive tutorial, and I thought, "Whoa, wait a minute. Where's the movers & shakers?" And voila, here's the tutorial explaining it. You answered my question before I asked it. Thanks! Yay! I feel I've been let in on some super secret really cool thing! You rock! I have been trying to solve the same problem...who knew? Thank you so much for posting this tutorial. So glad I found you via Google! Thank you, thank you, for the very explicit instructions! You must know some other people like me, who just can't figure much out on their own - or you're just too thorough. Way to go, girl!! I love your cards- beautiful ideas! Awesome! Thanks! 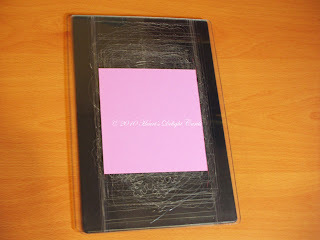 Just discovered and bookmarked your blog. Nice! Thank you for the great info. I was wondering if it was possible to use the Movers and Shapers dies without the magnetic base die. FANTASTIC!!! Thank you for sharing the instructions with us! Wonderful! Thanks so much for posting this ... I'm trying to figure out a Valentine's card, and this solved my problem.